1 pound of Wheatgrass, Packed in Zip Close Mylar Bag. 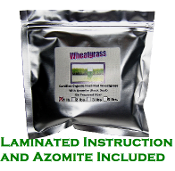 Includes Laminated Instruction & Azomite 70+ Minerals & Trace Elements. Certified Organic Wheatgrass Seeds–1 Pound-Guaranteed to Grow. 1 oz of wheatgrass is equivalent to over 2 lbs. of leafy greens. A shot of wheatgrass and you've met your vitamin requirements for the day. Improves digestion, fertility and stabilizes blood sugar levels. The high amount of chlorophyll increases oxygen levels in the blood, an important part of detox and cleansing. Has over 89 vitamins and minerals! More vitamin C than an orange, more vitamin A than carrots. Contains 30 digestive enzymes, and thereby aids in the body's digestive process. It is known to refine and renew cell tissues. Stimulates the thyroid gland, which is essential to regulate metabolism. Protects the body against chemicals that cause cancer.